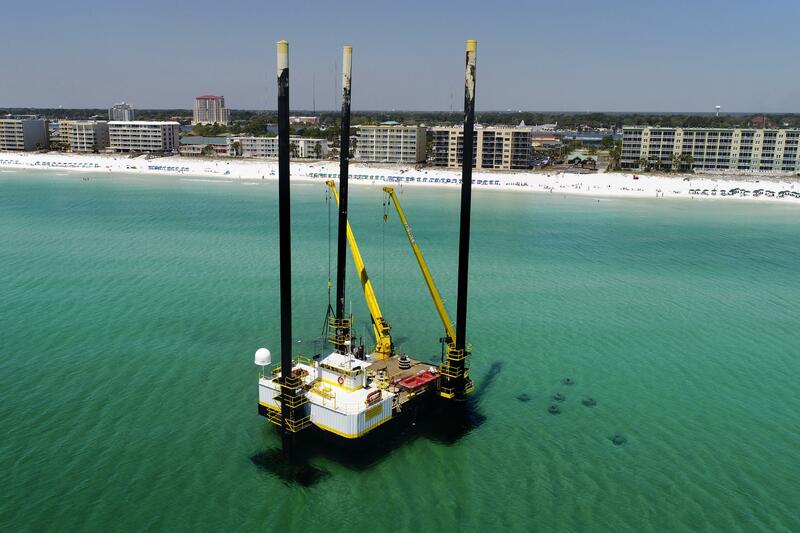 OKALOOSA ISLAND, FL — The Emerald Coast Convention and Visitor’s Bureau deployed Okaloosa Island’s first artificial reef Tuesday. The new destination for freedivers, snorkelers and scuba divers lies offshore from Okaloosa Island’s Beach Access 4. It is the first of 50 reefs that will be placed 500 feet offshore. Alex Fogg, Okaloosa County’s Tourism Development Department marine resource coordinator, said the project’s purpose is to give watersports enthusiasts an easily accessible place to enjoy Northwest Florida marine life. The reefs will be arranged in different shapes on the Gulf of Mexico floor, in designs that include starfish, sea turtles and dolphins. Fogg said the designs will be visible from above to parasailers, planes and helicopters. Okaloosa County plans to deploy four snorkel reefs in the coming weeks. Beasley Park, The Crab Trap Destin and Henderson Park East will be the three additional locations. That portion of the project will cost $700,000. The entire project, which will be $1.69 million, will add even more reefs farther offshore. Those deployments will not likely begin until fall.